To celebrate 40 years since he joined the Rolling Stones, Ronnie Wood has signed 400 special Anniversary copies of TOTA ’75. 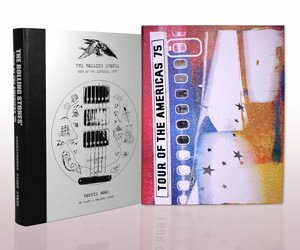 Keep reading for more details, or visit www.TOTA75.com to secure your copy today. Ronnie's first tour with the Stones was documented by the band in over 600 photos, items of memorabilia and a fascinating manuscript by their tour diarist Christopher Simon Sykes. 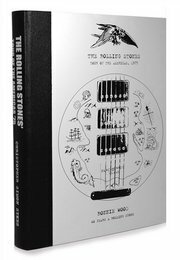 Originally released in a limited edition of 2,500 copies, the remaining 400 books feature different binding and will each be signed by Ronnie Wood. The book's new cover is designed to Ronnie Wood's approval, inspired by his iconic Zemaitis guitar. Its aluminium cover is silkscreened with beautiful engravings from the guitar’s metal disc front. Over 400 silver-edged pages are quarter-bound in leather and housed in a protective solander box. The 'Starship' is silkscreened onto the box, with lenticular images of the Stones appearing in the aircraft's cut away windows.